Located just 10 nautical miles from the Atlantic Ocean in Jacksonville, Fla., Dames Point Marine Terminal is JAXPORT’s newest marine facility. Opened in 2009, it includes a state-of-the art container terminal capable of handling an annual volume of 800,000 to 1 million Twenty-Foot Equivalent Units (TEUs). 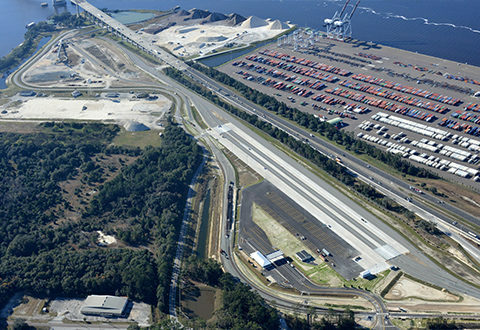 With an increase in container volume, JAXPORT recognized the need for an effective rail connector and the development of an efficient intermodal transfer facility (ICTF). In 2014, it decided on a design-build delivery for the project. Terracon partnered with TranSystems and D.B. Kenyon to deliver a quality project while optimizing the budget within a tight time frame. The new facility was constructed on approximately 45 acres of JAXPORT property and required relocating a mile-long public road that bisected the site. Components included remediation of lead from an old gun range facility, wetland mitigation, clearing and grubbing, unsuitable material removal, excavation and filling, importing base material, rock, asphalt pavement, reinforced concrete, roller compacted concrete, high mast LED lighting, buildings, gates, canopy, and railroad track. 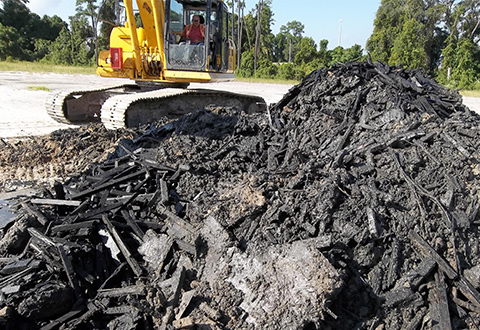 According to Tom Selfridge, senior geotechnical engineer in Terracon’s Jacksonville, Fla., office, the team decided to further investigate a minor mention made in a preliminary report of possible debris buried in the soil at the construction site. Historic aerial photos were quickly reviewed and indicated relatively large areas of disturbed ground. These areas were scanned with a geophysical survey, utilizing ground penetrating radar (GPR) and electromagnetic induction, to look beneath the ground surface for possible voids or debris deposits. Finally, suspect areas were ground-truthed with backhoe-excavated test pits. Results of the testing were significant. More than eight acres of the construction site had debris hidden under ground level, including pieces of charred wood timbers and sheets, and shredded metal intermixed with sand. “Without a thorough investigation of the site, the debris could’ve been missed and negatively impacted the construction,” said Selfridge. Terracon’s early awareness and resolution of the debris issue protected the project’s budget and schedule. Additional value was added by Terracon’s recommendation to screen the excavated debris deposit which allowed for re-use of its sand component and reduction in the volume and cost of the off-site waste disposal. Terracon’s resourcefulness continued to the construction phase as Chris Martin, Terracon materials specialist also in the Jacksonville office, adopted use of a geophysical tool (Kessler MIT Scan T2) to obtain real-time measurements of layer thicknesses during placement of roller-compacted concrete (RCC) pavements. After an initial test strip was completed to calibrate the contractor’s equipment and methods, the RCC was placed in multiple lifts up to a maximum total thickness of 20 inches. In addition to the value of real-time data, the scanner tool saved approximately $20,000 in testing cost as compared to the conventional rotary coring method, according to Martin. Testing of the rail components required knowledge and application of requirements set forth by The American Railway Engineering and Maintenance-of-Way Association (AREMA). Field density testing was completed on the sub-ballast material and welding of the steel rail tracks was checked by ultrasonic testing. In January 2016, the Port took beneficial occupancy of a $25 million state-of-the-art ICTF, delivered via design-build, on time and within budget. Doug Dunkelberger, P.E. is a senior engineer in Terracon’s Florida offices. He has more than 20 years of experience providing consulting engineering services throughout the U.S. with expertise in the unique challenges faced by ports and waterways, and intermodal facility projects.